As I am walking along Berry Creek on this beautiful day, I am struck by the sound of tapping on a small Ash tree. I climb down into the creek bed and begin looking for where the sound is coming from. It is a Hairy Woodpecker, Picoides villosus. I can tell it is not a Downy Woodpecker, Picoides pubescens, because of the size of its bill which is much larger and longer than the diminutive Downy. Their markings, however, are almost the same and can make it hard to separate them. I notice there are two of them working this tree, making loud rasping sounds along with the tapping. It is delightful to watch these birds, which could be a parent and a juvenile, determinedly looking for wood-boring insects in the bark of the Ash tree. These are one of our mostly resident woodpeckers which are found in forests, woodlands, riparian areas such as this one along creeks and rivers, and even in park areas. They seem to require larger trees than the Downy which is found in similar habitats. I have seen Downy Woodpeckers feeding on small weed plants like Common Mullein, Verbascum thapsus. 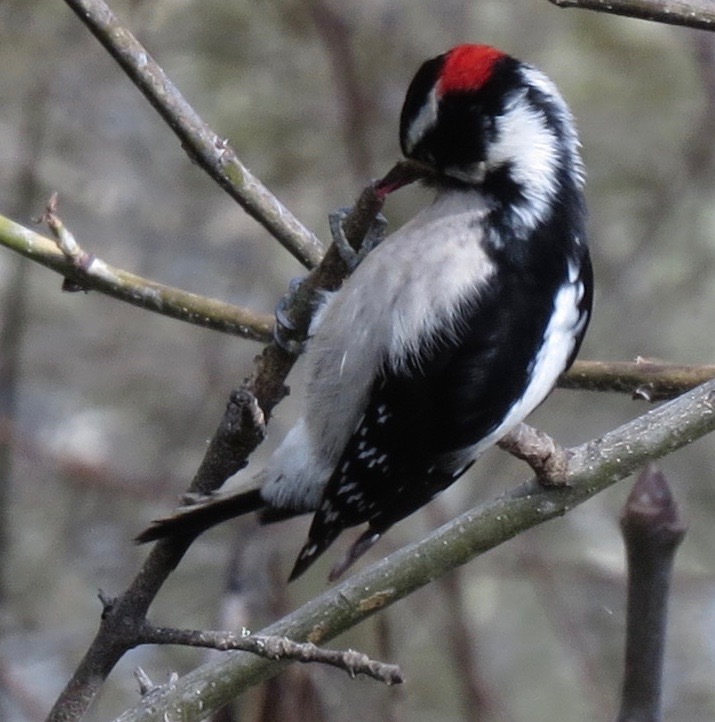 They are smaller than the other woodpeckers and can be found tapping on the very tips of twigs, as in my photo. 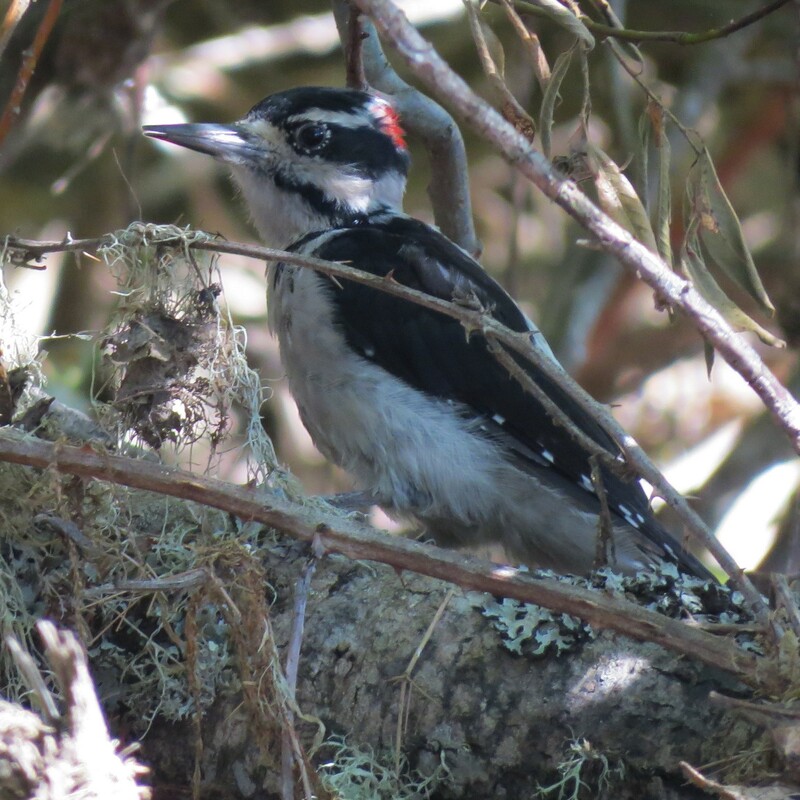 Both the Downy and the Hairy woodpecker, as with all the local species, are cavity nesters and their populations have been affected by a lack of snags in the past. I wonder if all the fires in the recent years have maybe now created more dead snags for nesting since it appears there are more of both of these species. It is not surprising when I hear a third species of small black and white woodpecker begin its rattle and calling right near me. 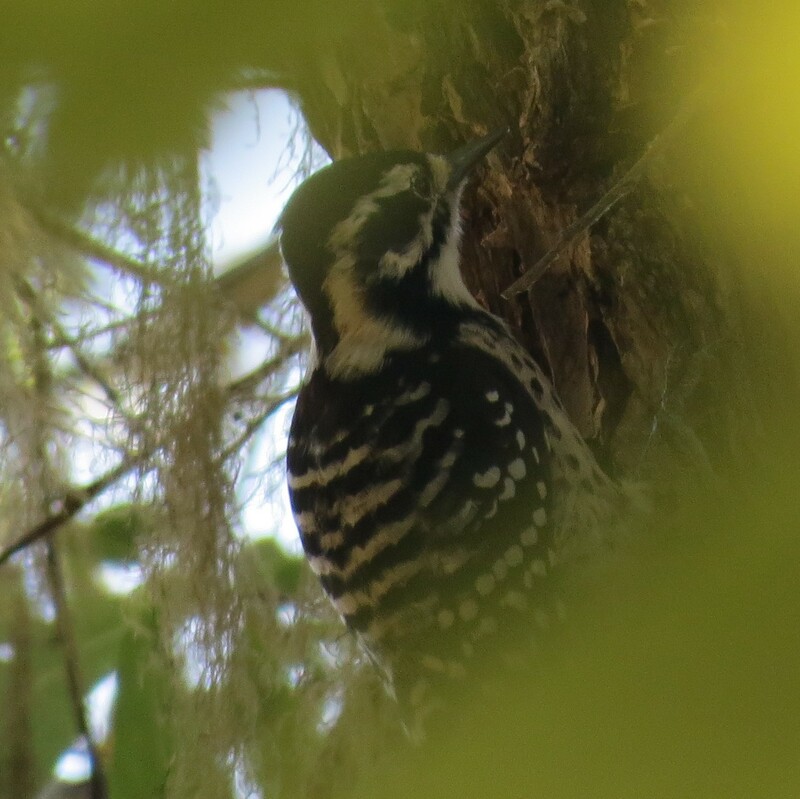 This is the Nuttall’s Woodpecker, Picoides nuttallii. This is one of our year-round resident woodpeckers with a love for oak woodlands or any open woodlands. Here because we have a mixture of oaks and ash trees, I find them often in the rows of Oregon Ash, Fraxinus latifolia, that cross and crisscross the valley floor. These are primarily insect eaters as are the other two species who also occasionally eat fruit like elderberries, poison oak berries, and blackberries too; the valley has all three of these in abundance! 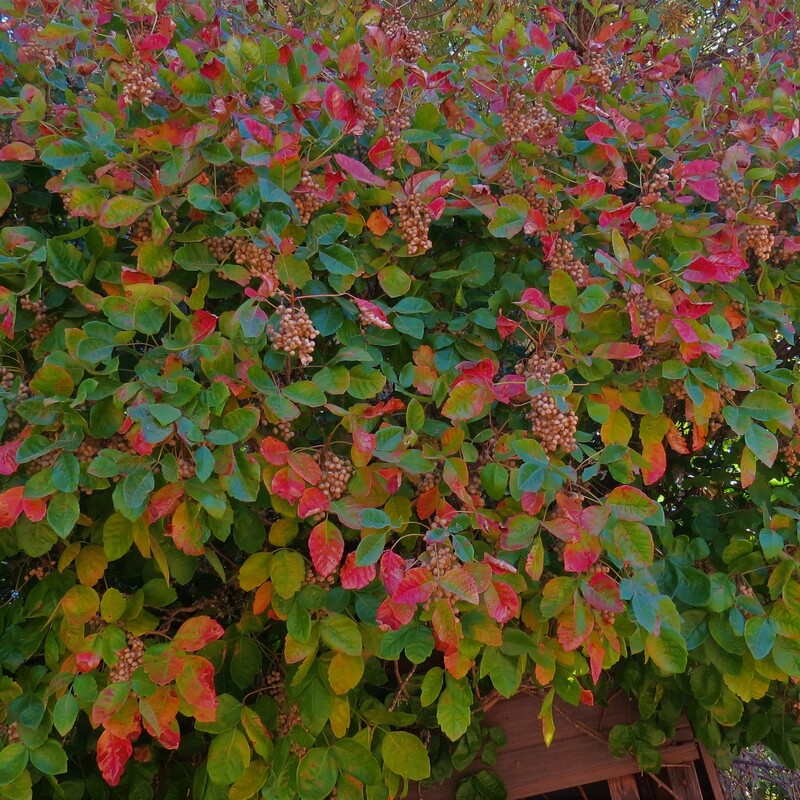 It looks like a beautiful painting made by mother nature herself! As I walk back I hear the distant tapping of more woodpeckers. Nice work, enjoy driving around Little Lake Valley each weekend in our quiet Bolt EV to view changes in conditions, such a wonder to share this cranes visit. Maybe next year it will return with a mate? I love this sweet story of the juvenile crane trying to find its place in the world. Thanks! Thanks for this wonderful naturalist account! So interesting about the invasive red crayfish. I’ll keep my eyes out for it when I’m in our creek. So far I think I’ve seen only the native ones.